The chief incalculable in war is the human will. Sir Basil Henry Liddell Hart, usually known before his knighthood as Captain B. H. Liddell Hart, was an English soldier, military historian and leading inter-war theorist. On 4 September 2006, formerly secret MI5 files revealed MI5 suspicions of leaks of the plans for the D-Day landings, and that Liddell Hart had known all the details three months before the landings took place, discussed them, and had even prepared a critique, entitled Some Reflections on the Problems of Invading the Continent, which he circulated amongst political and military figures. 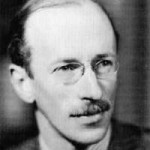 His previous criticism of the direction of the fighting in World War II raised further suspicions, even of German sympathies, although most modern biographers accept Liddell Hart's defence that he had worked out the plans for himself rather than had them leaked to him. Winston Churchill demanded Liddell Hart's arrest, but MI5 instead placed him under surveillance, intercepting his telephone calls and letters.